This year my daughter asked to learn more about photography. I think she gets her love for taking photos from me. I often joke that my camera is practically an appendage. If you check out my Instagram feed you will see what I mean. My camera arsenal contains a Nikon D5100 dSLR and a Note 4 Camera Phone (which sadly I use more than my dSLR). From time to time I will let my little shutterbug use my Nikon DSLR camera, but it makes me nervous so this year for Christmas she is going to be getting her very own digital point and shoot camera....shhh don't tell her! However I am by no means a professional and still have a lot to learn about taking photos. 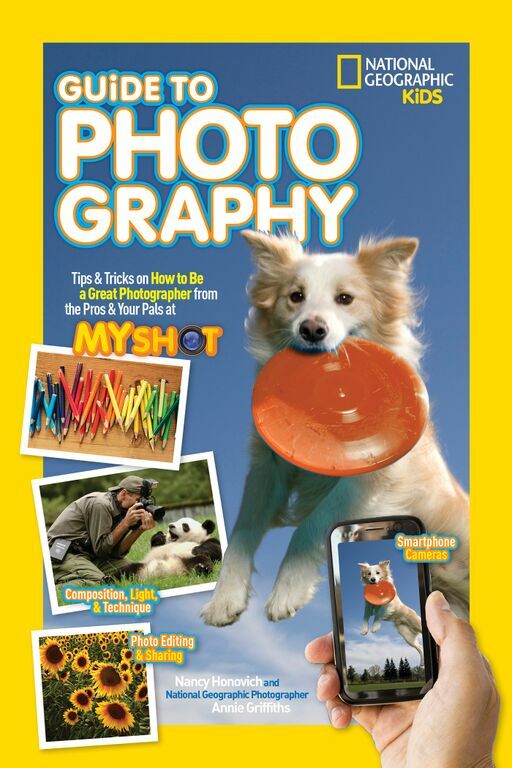 And thanks to National Geographic Kids and their new book Guide To Photography and MyShot Program I now have some amazing resources to help my daughter (and myself) learn more about photography! After all learning along side my kids is my favorite thing about homeschooling. Here are some further details about these two amazing resources from National Geographic. This 160 page soft page book was written by Nancy Honovich and contains photographs from Annie Griffiths a National Geographic Photographer. Annie is a long time National Geographic photographer and one of the first women photographers for the magazine. She has traveled to over 150 countries and photographed animals, landscapes and people from across the globe. 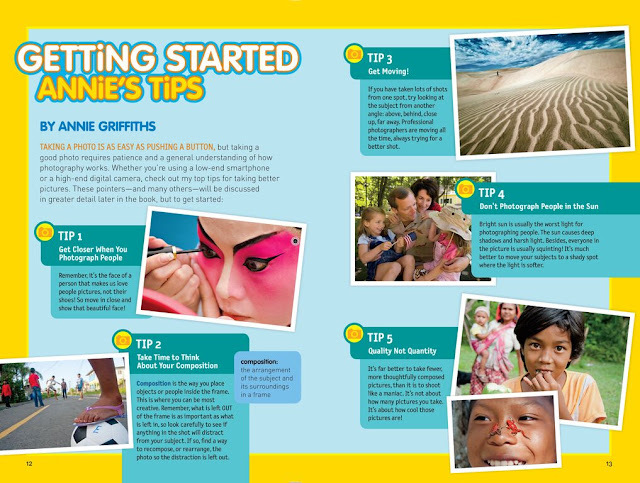 Annie actually took time out of her busy schedule to talk with the National Geographic Insider team and share 5 Photography Tips for Kids. But before I get to those 5 tips let me finish telling you about the book which is where you can find ALL of her tips and tricks. Guide to Photography is a great resource for kids who want to learn more about photography, it is also a great book for parents who want to learn more. The book contains tips and tricks for all camera types including smartphones, DSLR, point-and-shoot and even underwater cameras. The book features easy to understand step-by-step instructions, color diagrams and sample photos, information on editing and photo sharing, DIY photography activities, tips from experts, photography careers, ways to connect through the National Geographic Kids photo sharing community MyShot and assignments from Annie Griffith to test your knowledge. The Guide to Photography book can be picked up at your local bookstore or on Amazon and costs $14.99. Annie Griffiths always had a passion for telling stories, but when she first started there wasn't much in the way of kid friendly cameras. It wasn't until she was introduced to the camera in college that she found her passion for telling stories through photographs. Camera Choice - Have an old cellphone laying around? They can make a great first camera for kids! Most camera photos take great photos and if it's an older phone you are no longer using you don't have to worry too much about an accident occurring. Organization - Teach your child how to save and organize their photos (oh boy this is a tip I should listen and adhere to). Always name your pictures in a logical way so they are easy to find. When saving those photos, go through and delete any unwanted shots to free up space and make searching faster. Tell A Story - Encourage kids to use photos to tell stores. Ask them to take pictures the next time they're bored, to tell the story of their experience. It can be more than their literal interpretation of a thing. NO Chimping - Make a “No Chimping Rule” during outings. Chimping is the act of looking at your photos immediately after you take them and “oohing and ahahing” at every photo you took, something media professionals used to do shortly after digital photography was developed. Encourage your kids to experience the moment and not peek at their photos until the end of the event, outing, etc. Photo Editing - Let your child get creative with their photos by using photo editing programs like PicMonkey, Photoshop, Picasa, etc. Let them know that a photo editing program is like a dark room and that changing an image can be fun and great, but as a photojournalist, to tell a story, you never want to alter reality. Don't use Photoshop to alter the true story in any way! My Shot is an online community of photos taken by children (average age is 9; max age is 17) that gives them a safe and secure place to share their work. Each month images are selected from the community that showcase settings, moments and beauty. 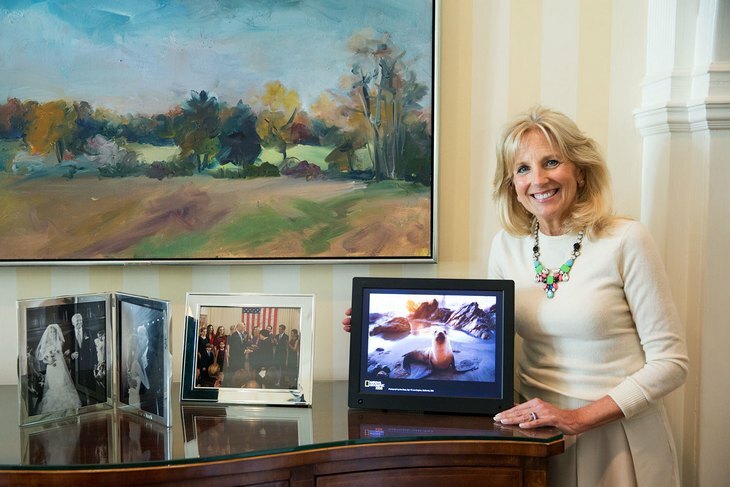 Those photos then have the privilege of being displayed in the living room of the Vice President Joe Biden and his wife, Dr. Jill Biden's home, on a digital picture frame. The partnership between Dr. Jill Biden and National Geographic Kids was announced in July of 2015 in dedication to celebrating the talent, creativity, and education of children! A couple of weeks ago I had the privileged of being on a conference call with Dr. Jill Biden who is a dedicated mother, grandmother, educator and Second Lady of the United States of America. She is so dedicated that she was grading papers two days after her husband was sworn in. Not only did she discuss her collaboration with the MyShots program but she also shared the import role parents and educators play in inspiring children to learn more about the world around them. She is truly passionate about getting children involved and said "As a teacher, mom and grandmother, I share your passion for encouraging our children to learn all about the world. Education has been my life's work." As a homeschool mom I really appreciated Dr. Biden's belief that parents and educators need to work together to help, guide and inspire children. I chose to keep my children at home for many reasons and one of them is that I feel the connection between parents and teachers is gone. Dr. Biden stated, “I think it’s up to the teachers and the parents to create that interest. Jill suggested several ways of sparking a passion, suggesting educators and parents work together and have a dialogue with kids about culture and geography by reading or watching quality programs that explore the world." One of the other things we discussed with Jill was how education has changed. Jill feels technology has become the biggest factor. She reminisced with us about her time in school as a little girl and even recalls the time she sat in the one room schoolhouse her grandmother used to teach at. Isn't that awesome? She still has the brass bell her grandmother used in her classroom! Jill is also passionate about women's issues and military families and has even written a book called "Don't Foget, God Bless Our Troops." She also works with closely with the National Geographic Bee a National Geographic competition designed to inspire students to be curious about the world. To read more about Dr. Jill Biden and her work with the National Geographic MyShot go here. So do you have a child interested in photography? If so be sure to check out these great resources. 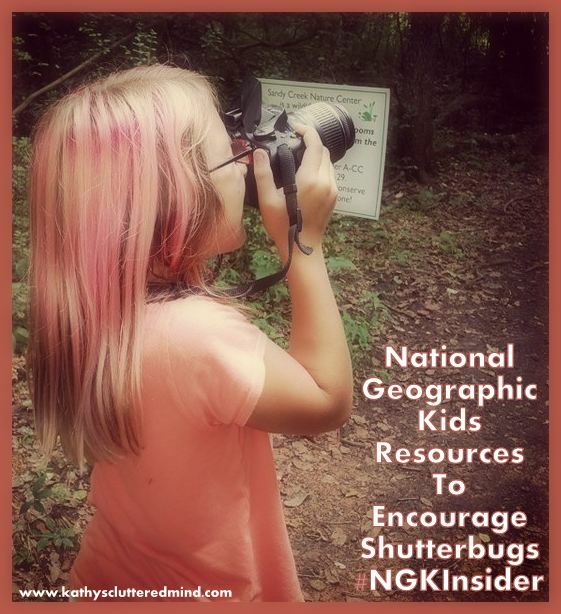 You never know your child could become a National Geographic Photographer one day!